Former crab catcher turned expedition superyacht SuRi is set for another refit - this time an 11 metre extension which will increase her overall length to 63.4 metres. The California-based Bay Ship & Yacht Co has been awarded the contract, which will involve adding a mid-body section to the hull and superstructure and extending the sundeck by just over 7 metres to create a new alfresco dining area. Naval architects for the project are Kirilloff and Associates of Florida, and Jeffrey Botwin of Herringbone Design, California is working on the interior design. On the bridge and heli deck the added length will be used to create a spacious glass-enclosed guest lounge aft of the existing saloon. Guests will be able to use this flexible area in a number of ways - incorporating it into the existing saloon, closing it off as its own climate-controlled space, or fully opening the glass panels to the sea breezes. Two additional guest cabins will be incorporated into the mezzanine level and the existing two cabins there will be expanded and reconfigured. All will have unobstructed views. The extra space created in the main deck hangar will allow for the stowage of even more toys and tenders than SuRi currently carries. An underwater viewing room with two large 'windows to the sea' will be added to the hull extension area on the portside lower deck, and a new media room will be created with a state-of-the-art audio-visual system and space to relax and chill out. A fully equipped gymnasium will be located on the starboard side, with the potential to become an additional lounging area, meeting room or children's play area. For a larger, heavier yacht, new engines will be required and SuRi is set to get twin Caterpillar 3508 engines, offering more horsepower, quieter running and less environmental impact, which will translate into higher speeds and better fuel efficiency. The generators, too, will be upgraded to quieter and more efficient Cat 125KVA 60 Hz models. Overall, the yacht's increased mass will improve her stability and ride comfort. SuRi is an American-built hull that was converted in Seattle in 2007/2008 and is owned by an American (Californian) yachtsman. 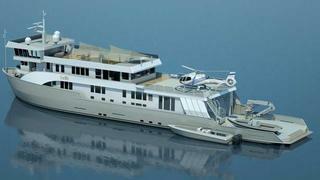 Her refit, which is the largest to be carried out in the USA for many years, is expected to be completed by June 2012, and will be overseen by Bureau Veritas, the yacht's classification society.